Right: this species has a stiff, trunk-like branching stipe. Photo by Wiebe Nijland. Top left: long, thin, strap-like blades that cluster are a key ID feature of flat pompom kelp. Bottom left: the stipe branches dichotomously many times, with each terminal branch leading to a blade - this branching is also indicative of this species. Photos by Joel White. 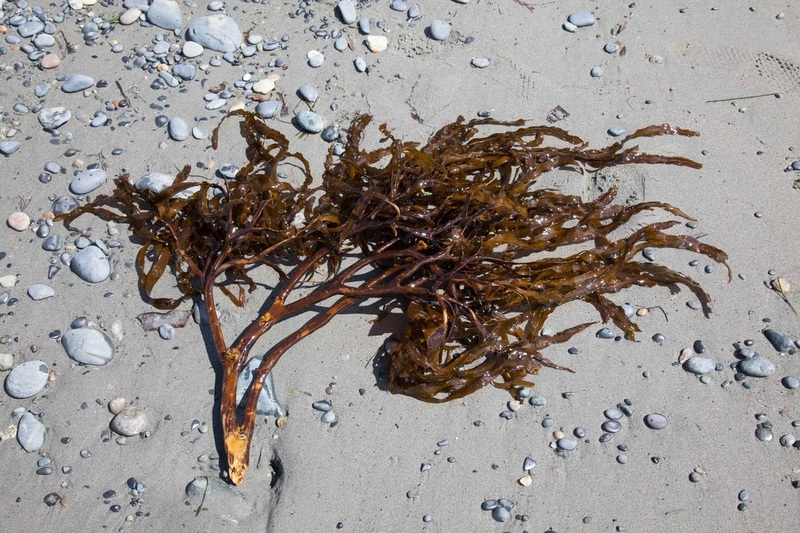 Flat pompom kelp is a medium to dark brown kelp and is characterized by a stiff, trunk-like stipe with multiple dichotomous branches that lead to clustered, strap-like blades (see photo of branching pattern). Each blade has a midrib and can be up to 1 m long. Flat pompom kelp has large, conical holdfast that is composed of many branched haptera and can reach 15 cm across. A single individual can have up to 500 blades, each arising from its own stipe branch. Sporophylls grow near the base of older blades; they lack midribs, and are shorter and wider than the sterile blades. 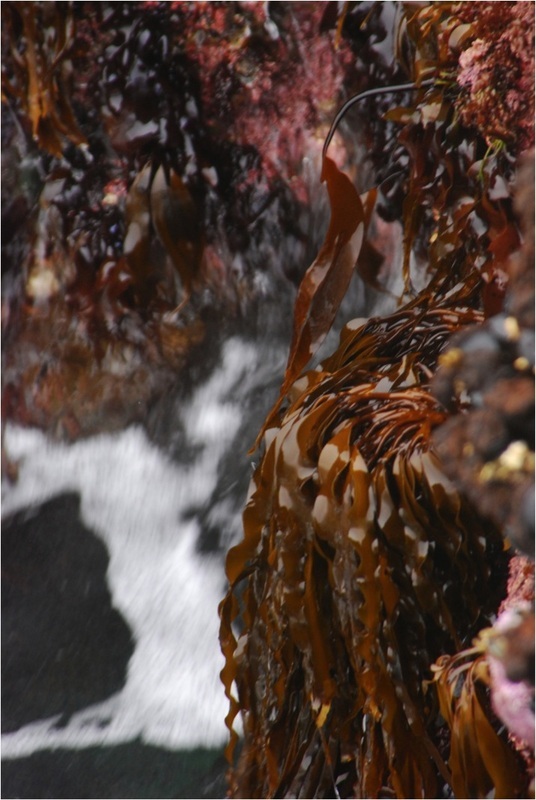 Flat pompom kelp is found in the very low intertidal and shallow subtidal of exposed rocky habitats. 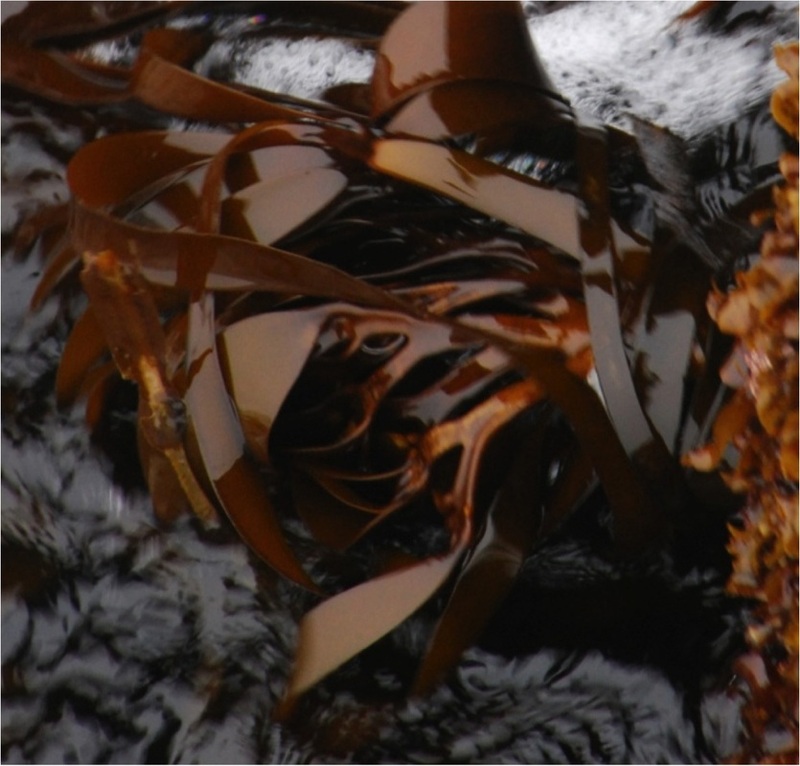 It usually exists in a narrow zone below sea cabbage (Saccharina sessilis) but above southern stiff-stiped kelp (Laminaria setchelli). Its range extends from Kodiak Island, Alaska to Monterey County, California. Northern rhizome kelp (Laminaria longipes) has similarly clustered strap-like blades, but has a rhizomatous holdfast rather than a conical hapteroid holdfast. Lindberg, M. and Lindstrom, S. (2010). Lessoniopsis littoralis. Seaweeds of Alaska. Accessed 05/08/2014. O'Clair, R. and Lindstrom, S. Lessoniopsis littoralis (Tilden) Reinke 1903. In Klinkenberg, Brian. (Ed.). E-Flora BC: Electronic Atlas of the Plants of British Columbia. Lab for Advanced Spatial Analysis, Department of Geography, University of British Columbia, Vancouver. Accessed 05/08/2014.